More than ever, globalization and interconnected economic activities have driven business competition to unprecedented levels. As a result, businesses are finding it hard to operate in isolation prompting them to constantly innovate lean ways of improving business. A clever place to start is resource allocation. Resource allocation improves your competitive edge, helps reduce redundancies and other operational inefficiencies. So a business owner looking to develop a software, how do you keep up with the fast-paced technology space without draining your coffers? Contracting or Software development outsourcing is the ultimate solution and your gateway to success. It’s a deep-rooted practice that allows businesses to allocate assets more efficiently, complement core competencies, widen product portfolio, and saves costs along the way. Offshore software developers can help if you are considering a new software development project. Frequently, however, you might have unanswered questions about how to select the right partner. This post will show you how you can make use of outsourcing and get the right partner to implement your software. Outsourcing has gone fully mainstream with the best and biggest companies in the world turning to outsourcing partners for some of their development. Software development outsourcing is a business practice whereby a company hires an individual software developer or a company to undertake and deliver software instead of using an in-house team. In a ruthless and technologically competitive environment, it’s highly unlikely for your company to develop a whole spectrum of viable software while operating on a limited budget. Offshore outsourcing is the perfect strategic approach to success for your company as it helps improve the competitive edge by reducing the internal costs through decreased payroll plus it allows you to focus on core competencies. As we all know, software development is a fast-changing field. Every now and then, new programming languages, software architectures, and methodologies continue to emerge. Some of the tools and languages used today could be rendered derelict next year. According to the Global Outsourcing Market report of 2018, the outsourcing market is set to see a 4.42% CAGR between 2018 and 2022. However, despite the promising future, the dynamic nature of technology will continue posing a challenge to the industry. Therefore businesses will have to keep up with the outsourcing trends to continue staying afloat and reap the benefits of software development. For example, the trends in the big data software market have seen businesses demand for accessibility, agility and in-depth analysis of customers’ behaviors to make more informed business decisions using the collected information. BaseCamp – Basecamp is one of the largest project management software companies, with Jeff Bezos as an investor. The company used outsourcing to develop some of its core software. Groove – Groove is an app that provides help desk support to other businesses. According to the Groove company blog, founder Alex Turnbull turned to outsourcing to develop the app because he could not find a technical co-founder. He outsourced the work to a software agency instead. Slack – Slack is a professional chat application for business teams, valued at over $5 billion, as reported by Fortune magazine. According to the HuffingtonPost, Slack outsourced its UX and design to a team called MetaLab. As earlier indicated, most businesses result to software development outsourcing companies to reduce overhead costs. However, save for the cost reduction in terms of facilities and equipment, the salaries are significantly reduced giving budgeting a whole new meaning. You could be working with equally qualified professionals but the overall overseas salaries are significantly different. For example, outsourcing Ukraine provides can reduce your overall software development cost by up to 60%. With the increasing demand for software developers globally, recruiting and staffing of these professionals have become even harder. Software offshore outsourcing helps widen the scope by eliminating the geographical barriers. As a result, you have a large pool of talented developers depending on the outsourcing company of your choice. Having overlapping time zones means that you can have a quick virtual meet-up to resolve occasional issues quickly. On top of that, you could benefit by having your work executed outside your local time at the close of your business day. Contrary to this, an in-house team would have to burn the midnight oil to introduce even the slightest changes to avoid interrupting key services. When undertaking software development outsourcing services, most businesses grossly underestimate risk management. However, during software development outsourcing, the two parties have to find a consensus on how to share risk management. Managing all the risks associated with software development is better handled by an outsourcing company since its part of their core business. Another huge advantage of hiring an outsourcing company is that you do not need to create and manage a development team at all. With the elimination of infrastructural costs, your projects can easily take-off which means faster deployment. Feel all the benefits of software outsourcing! Can Software Development Outsourcing Support Business? You may think that the primary motivation of outsourcing is limited to cost-cutting. However, over the past few years, the outsourcing industry has marginally evolved with most software development outsourcing companies literally investing millions into the quality of the services they offer. Nowadays you can be sure that will get high-quality development or web design outsourcing. Here are some few ways on how software offshore outsourcing can help support your business. When faced with a complex project requiring special skill sets, you may be forced to seek the services of an outsourcing company. When you team up with experienced software outsourcing companies, you get to build cutting-edge solutions using the latest technologies without necessarily having to master them. With the demand for exceptional developers outstripping supply, getting the right person for your project can be an extremely hard expedition. For large organizations, building an outstanding software requires large recruitment efforts or help from software development outsourcing companies. Hiring outsourcing companies not only saves you money but gives your business fast access to experienced developers. With the experience, comes reduced turnaround time for your projects which means faster deployment. Software development outsourcing is a perfect opportunity for improving internal development processes. Most outsourcing companies are eloquent in agile methodologies, best design patterns, and give valuable insights on these topics. Writing a great software requires occasional new approach and out-of-the-box thinking. By utilizing software development outsourcing companies, your business will almost certainly reap the benefits of new perspectives and fresh ideas to improve your project. Ukraine is a leading outsourcing center. This European country is distinguished in the outsourcing market for its very talented software developers and their versatility. What you will find in working with a software development outsourcing Ukraine I.T. firm is that their tech talent is comparable to what you find in major Western technology centers such as Silicon Valley. Ukrainian offshore software development companies are developing using highly efficient modern technologies like React.js, Python, and Scala. That’s not to say older technologies like C# .NET or Java are not in use. They are very much used, along with all the latest technologies that are in vogue in London, Silicon Valley, and other startup centers. In order to help you select the right outsourcing partner, we’ve assembled the following list of criteria to help you choose the right provider. Want to outsource your software development? Why Choose Outsourcing Software Development in Ukraine? Whether you are a small start-up or a multinational company, outsourcing is a worthy consideration. One of the best places to start sourcing for skilled professionals is Ukraine. Influential media houses and large corporations have termed Ukraine as the “Silicon Valley of Europe”. As earlier indicated, the location of your outsourcing partners can significantly affect the progress of your work. Compared to other European countries, Ukraine has the best strategic location as its an hour ahead of other European countries plus it intersects the American and Australian time zones. By outsourcing software development in Ukraine, you have better communication, operational monitoring, and control over your project. Ukraine has some of the lowest income taxes in Europe. IT specialists only part with 5% of their income as tax meaning the country has a happy and equally motivated workforce. In terms of development costs, you can save up to 60% of your budget outsourcing software development Ukraine without compromising on the quality of your app. Ukraine is a melting point for software development outsourcing services. Multinational companies like Apple, Intel, Nokia are some of the biggest consumers of Ukraine software outsourcing services. That notwithstanding, the outsourcing market in the country is advanced compared to that of other European countries like France. Software developers from Ukraine are also worth their salt as they possess serious set of IT skills to develop solutions for both the domestic market as well as the international arena. Ukraine has some of the most liberal corporate laws in the world. They allow for cooperation between native and foreign companies which is a big plus for any business. For example, Ukraine software outsourcing is VAT exempted which can help you save a lot. In terms of mitigating infringement on Intellectual Property, the Intellectual Property Court in the country helps mediate and resolve outsourcing services disputes that may arise in the course or even after completion of projects. Even better, foreign firms can set base in Ukraine as long as they are compliant with the Ukrainian laws. Ukraine produces some of the best It professional in the world. Each year, universities graduate skilled professionals to satisfy the demand for software engineering outsourcing both locally and internationally. Even better, over 80% of software developers in Ukraine are fluent English speakers meaning language barrier is nipped at the bud. 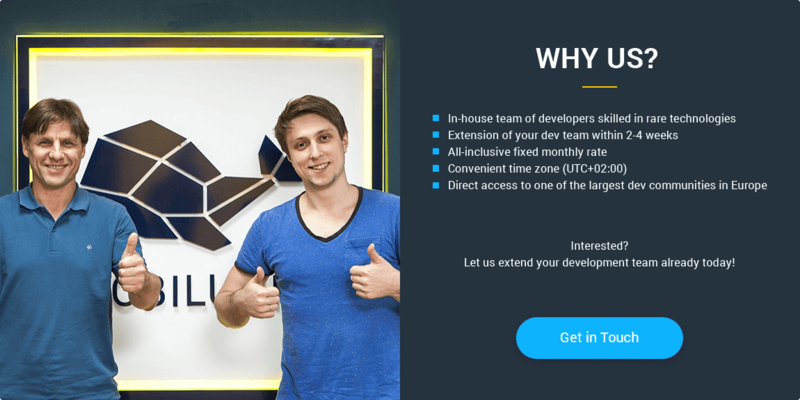 Outsource your software development to Ukraine? It might seem tempting to imagine that the lowest budget software shop with just a couple of developers can do everything from ecommerce to large machine learning projects. However, chances are, a larger operation would be more suited to execute on such a diverse mandate. Therefore, you need to be realistic about what your software development partner can and cannot do. Leading outsourcing companies like Mobilunity have developed a track record in the market. For example, Mobilunity is ranked highly in a recent ranking of the top Ukrainian nearshore software development providers. A company with a stellar reputation like that is an indication of great work conducted on behalf of clients just like you. High client ratings are only possible when clients are satisfied with the quality of software development the agency is able to provide. In addition, having a reputation to protect gives the outsourcing company extra incentives to over-deliver. In cases where software development companies are able to provide comparable levels of skill, delivery time can make a difference. Differences in staffing and management can make a significant impact on how quickly you can get your software completed. A word of caution: faster is not always better. However, rapid software development approaches can save you precious time which you can put into refining your products. As a rule of thumb, it’s best to go with nearshore software development companies that save you time as well as money. 4. How Well Versed Is The Company in Serving Your Industry? While there are commonalities in software development regardless of industry, differences do exist. Sometimes, knowing the inner workings of an industry can make or break an app. If you are a fintech startup, it helps to select an outsourcing firm that has worked on financial applications in the past. Likewise, if you are a media platform, select a company that has helped other newspapers and media organizations successfully develop their platforms. Software organizations vary greatly in their technical culture. For example, companies are split on their use of techniques like Scrum, TDD, BDD and Pair Programming. The good part is that, whatever your preferences regarding technical culture, you will likely find software agencies that share your values. Working when you are in alignment like this helps both you and the outstaffing company do your best work. If you choose a firm with whose values you are misaligned, the experience could be frustrating and unproductive for both parties. The result is that some outstaffing firms can provide certain services more effectively and efficiently than others. When you are looking for the right partner, you need to take into account the areas of expertise of your outsourcing firm. The success of startups like Pinterest that use well-crafted design to differentiate their products has raised the profile of design. You might think that a software outsource company cannot deliver standout designs, but you would be wrong. Software engineering outsourcing isn’t just a matter of choosing a provider, explaining what you need, and waiting for the finished product to be delivered. This is especially the case if you have ambiguous goals and an incoherent follow-up strategy. The following 10 tips will help you turn a potentially ho-hum outsourcing experience into a win-win scenario. The first step to a successful software development outsourcing process starts by writing a detailed outline of the purpose of your project. Assuming you are a startup, there are a few hard questions you will need to ask: How will the software help in customer acquisition? What are your must-have features? What is the target market? How will the UI/UX look like? Do you need software outsourcing services? Etc. Equally important, it’s prudent to conduct market research to establish what your competitors are doing to deal with similar problems. This will help you create a differentiating factor in your software giving you an upper hand over them. Although all these different questions and considerations may puzzle and overwhelm you, the bottom line is getting to know the purpose of your app and what you are looking to accomplish with it. Ideally, you should look for an offshore software outsourcing company that not only specialize in coding but the one that can offer an advisory opinion to help you devise a roadmap for the future software versions. The past projects of an offshore software outsourcing company illustrate their expertise. Before commiting to software offshore outsourcing, gather as much information as possible about the company to establish the type of skills and knowledge the team members will bring into your project. This information gives you a clear picture of the previous projects the offshore software outsourcing company has handled in a similar domain and the experience they have in decoding your software requirements into apt solution. Always settle for software development outsourcing companies familiar with hybrid agile methodologies and allow you to directly communicate with the developers. Lastly, always engage in casual chats and gather solid information about the developer’s aptness during these interactions. One of the biggest reasons why companies choose software development outsourcing services is the massive cost-saving opportunities it brings. However, unless you are working on a one-time mortal project, never let the price be your compass. There are multiple software outsourcing companies obsessed with “racing to the bottom” for the sole purpose of making a buck. In the course of your search, you will most likely come across one but beware – if their price is too low to be true, the same will be reflected in the quality of your end product. Ideally, you would want a highly competent team that delivers a bug-free code which is why you need to find professional partners with the necessary skills to execute your project. As a starting point, you can request referrals from your network or use RFI during your negotiations to come up with a win-win scenario for all the parties. Another important aspect to consider before working with an outsourcing company is getting to learn the wide assortment of software development technologies such as Windows XPF, Xamalin, Unix, and others. It’s from the unique attributes of the various technologies that you get to decide the technology you want your application built on. In the course of offshore software outsourcing, you will occasionally find a company that wants to only commit to the ultimate deadline. Never risk hiring outsourcing companies that don’t want to commit to mini-deadlines as its a recipe for disaster. Right from the onset of your project, choose a outsourcing company with a proven track record of timely delivery. This gives the team ample time in testing and reporting bugs plus allows your employees enough time to orient themselves with the running of the software. To ensure that your project is on time, draw a detailed schedule with mini-deadlines, meetings, and update calls. That way, you can rest knowing that your project is on target. It would be costly to pay thousands of dollars to an offshore software outsourcing company only to discover they leaked your app to competitors before deploying it. Now, the excitement and frenzy of a progressing project can lead to overlooking ownership rights until problems catch up with you in the post-release period. In the recent years, uninformed business owners have found themselves battling massive infringement suits due to lack of a clearly written contractual agreement stating who owns what. To avoid such conflicts, ensure your contract clearly spells that the party that pays for the software have exclusive rights and claim over the app ownership. You can also minimize risks by adopting creative payment models. Devise milestone payments where you get to release the payment to the offshore software outsourcing company once small parts of the code has been done and delivered to you. The strength of any remote software development team lies in its diversity. However, when seeking for software development outsourcing services you will likely encounter different cultural norms and behaviors than those you are normally accustomed to. Although it’s a good thing, a slight misunderstanding can significantly impact your work irrespective of how good the offshore software outsourcing company is. Always be ready to factor in the country and culture of the service provider. For example, Ukraine outsourcing market is totally different from that of the US or UK. As a business, it’s important to note that you are developing a software, not for personal use but to streamline your services and allow for better interaction with your customers. For this reason, choose a software outsourcing company with the expertise and resources to deliver an exceptional user experience. Always avoid a one-off utility that only focuses on solving short-term problems as it will be rendered derelict over time. Instead, invest in a highly polished and user-friendly software that will push you until the necessity of an update arises. Many software applications hold classified and proprietary information. As a result, both your business and clients are exposed to some element of risk in case the software malfunctions. Ensure that the outsourcing company you are about to work with is insured to work on high-safety systems. This way, they will implement safety valves to safeguard personal and proprietary data. Always work with software development outsourcing companies that meet all the regulations including but not limited to privacy and accountability laws. Some of these regulations may vary depending on location so it’s probably a good idea that you let the company familiarize with some of the laws within your jurisdiction. On a personal level, ensure that you are familiar with the laws within the jurisdiction of the outsourced partners and ensure they are compliant. Ukraine outsourcing laws are some of the best in terms of protecting foreign firms. Software engineering outsourcing has emerged as a popular remedy for empowering companies that are undergoing temporary tough times. It goes beyond reducing overhead costs and solving your programming needs as it accelerates your business operations, Improves market competitiveness and drives up profitability. You also get to work with talented individuals who would otherwise be unavailable. If you are looking for an outstanding collaboration for your software development projects contact us. We are an offshore software outsourcing company Ukraine has with a team of skilled and experienced developers. Discover the advantages of Ukraine outsourcing by contacting Mobilunity now!